This is my second add-on for KODI, or better yet, a script. It is installed under "programs". What bothered me with KODI is that it doesn't create thumbnails for all image folders. You see, I have my photos structured under the year/month/date folder structure, and KODI only creates thumbnails for folders on the last level. So that means my years and months are just generic folder icons instead of thumbnails. This plugin takes care of that. It scans all your pictures folders and creates folder.jpg image for each folder. 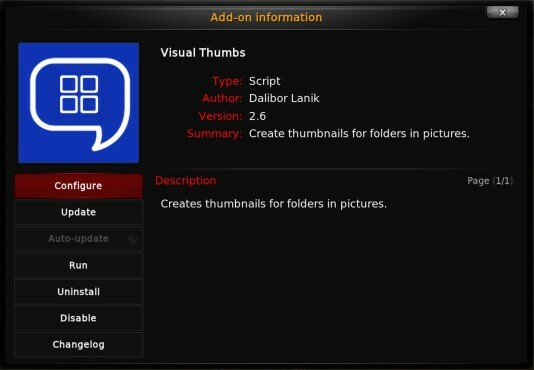 In options, you can select where thumbnails will be created. 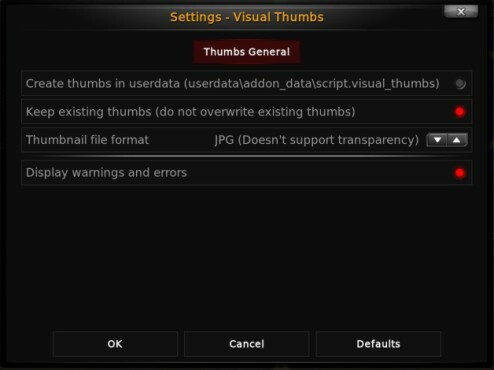 Default is of course, their respective folders (where your images are), but since some Android boxes with android > 5.0 don't allow you to write to external storage, there is and option to create thumbs in userdata folder of KODI. Then you can move/copy them manually to the images directory using ES explorer or other file manager. Windows and Linux shouldn't have these problems, only Android. The folder structure is kept, that is, it creates folder structure of your images directory. There is also an option to keep existing thumbs, so if you add new folders, you don't have to re-create all thumbs all over again (could be time consuming). The thumbs can be in either JPG or PNG format (only PNG ofcourse, supports transparency). Available from my repository and should work on all platforms.